Happy Bloggers Challenge Friday! I hope you had a wonderful Thanksgiving spent with family and friends! If you're out looking for bargains today, be sure to check out these Black Friday Stamp Specials, you don't even have to leave your house, you can shop online in your jammies! This weeks Bloggers Challenge is one of my favorites - Alter It! The BC Players are so creative with altering items, I can't take a peek to see what they came up with! 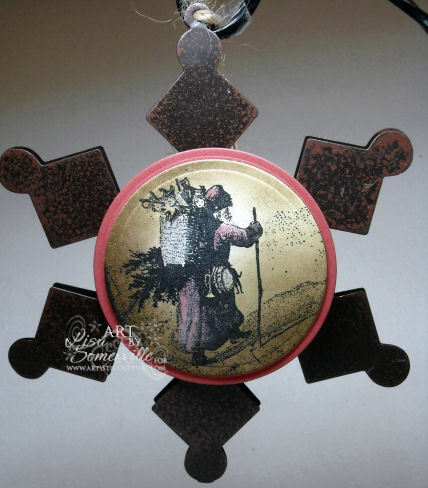 I decided to alter this rustic snowflake ornament I had in my alterable stash. I stamped the image from the Snow Woods Plate from Artistic Outpost on Vanilla card stock, then used the Sepia Technique to add my color. I cut my panel with Spellbinders Circle Dies, then layered it onto a Ruby Red Circle, and adhered to the ornament with dimensionals. Thanks for stopping by! If you're looking for more inspiration on altering items, be sure to click on the Bloggers Challenge Logo on my sidebar. Have a great weekend! Very pretty! I love these Santa images and the way you make them look spectacular! Love your project, Lisa! That image is perfect for it! That is gorgeous!!! I can see a whole vintage tree with these beautiful ornaments! Great job, Lisa! You incorporated two of my favorite items - the vintage santa and a snowflake. Lisa--this is wonderful. I LOVE the look of the vintage woods walker. What a beautiful decoration, Lisa! OHHH, love it....vintage and gorgeous! What a great project!! Love the vintage look!! Great way to dress up an old ornament. Love the "vintage" feel.